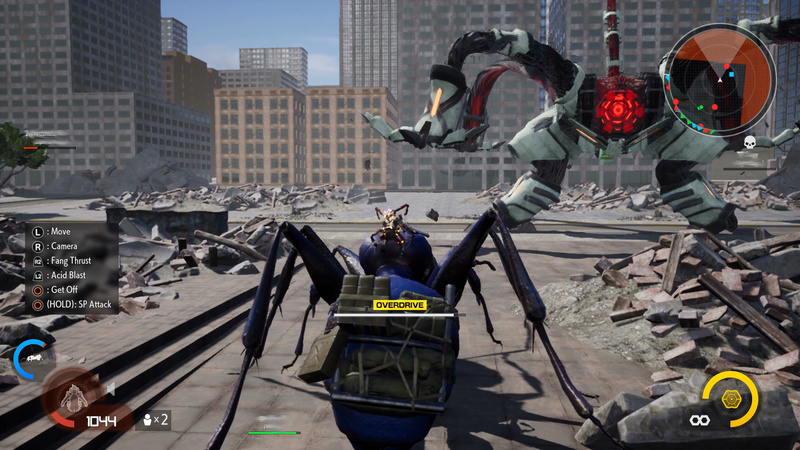 Earth Defense Force is a cult favorite series traditionally developed by Japanese indie developer Sandlot and published by D3 Publisher. 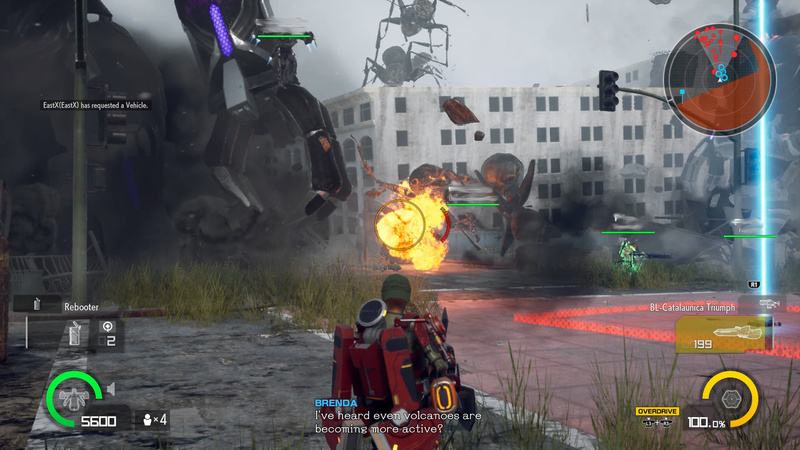 D3 Publisher has never been shy about allowing spin-off games to come from different developers, including the disappointing American-developed entry EDF: Insect Armageddon. Eight years later, developer Yuke’s has released an entry targeted at western audiences in the form of Earth Defense Force: Iron Rain. Not only is Iron Rain a fresh new take on the series, it adds 6-player online co-op! Iron Rain takes place in a different continuity than other EDFs. This one begins with a single-player tutorial mission. After the tutorial, players get to customize their character – a first for the series. Customizations include gender, a few body types, facial details, and a stunning array of clothing. Only a few tops, bottoms, headwear, and facial accessories are available early on. But as you complete missions, you’ll unlock a surprising array of gear with which to personalize your soldier’s look. Dressing burly men in dainty ladies’ clothing or adorning your female fighter with cat ears or a hockey mask are just a few of the myriad options. 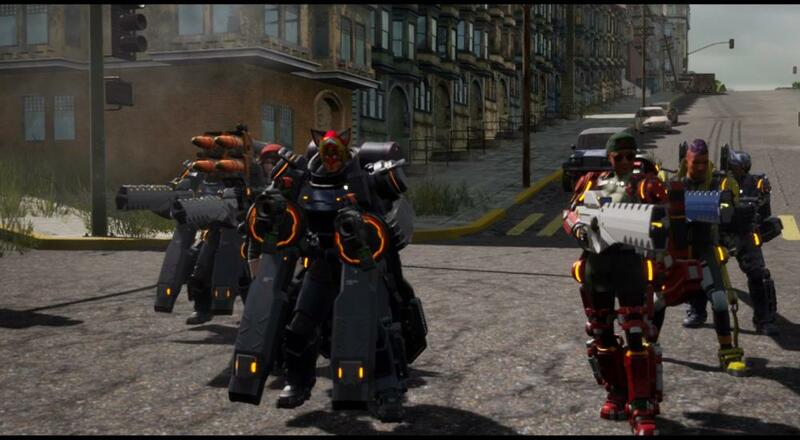 Beyond customization, Iron Rain brings several changes from mainline EDF games. First, Yuke’s developed it with the Unreal Engine rather than Sandlot’s in-house engine. The result is a much more beautiful game with larger, more detailed characters, impressive environmental textures, improved lighting, and gorgeous explosions. Like Insect Armageddon, this one displays less enemies on-screen than traditional EDFs – but things still get pretty hectic. The default camera angle positions your hero a bit far to the left side of the screen, but you can switch to a more standard angle as well. With the new look comes a small array of familiar enemies and numerous entirely new ones. Ants, flying ants, and spiders should all be familiar to EDF veterans, though these spiders primarily attack by spawning explosive babies rather than spitting webs. New foes include scorpions (with obnoxious poisonous venom), gas-spewing beetles, several types of robots, and even a fresh pair of kaiju monsters. A few of these beasties aren’t necessarily fun to fight – the skinny, plant-like Sideros are particularly deadly – but encountering so many new-fangled enemies in an EDF game feels downright opulent. Combat against those alien and insectoid monsters stands out from previous EDFs thanks to Iron Rain’s novel lineup of playable classes (referred to in-game as PA-Gear). Each class has unique stats that make it better than others at defense, mobility, or item capacity. Initially, players can select from the Trooper and Jet Lifter, this game’s equivalent of the Ranger and Jet Diver. But after twenty or so campaign missions, the Heavy Striker (Fencer) and Prowl Rider will unlock as well. Beating the final mission unlocks a fifth class as well. The Prowl Rider is a brand-new class that can grapple onto objects and buildings à la Attack on Titan and has a particularly cool Overdrive ability. Overdrive is a new mechanic that can be used once per mission (unless you bring along an extra energy core). Overdrive lasts for a short time and enables unlimited energy for dodging/blocking/etc. as well as faster reloading. It also allows the Prowl Rider to summon a giant insect mount. There are three regular mounts to choose from: ant, spider, and scorpion, along with three that unlock after beating the game. Mounts tend to die in one hit on higher difficulties, annoyingly. But they can greatly assist with damage and dodging while they last. Another way that classes differ here is that each one shares the same health limit and weapons pool as other classes. You’re not really switching between different types of soldiers; you’re just changing the PA-Gear that your custom soldier wears. Sure, this makes the classes less unique from each other. But being able to use any weapon with any class is a great convenience for players. Speaking of weapons, unlocking weapons, items, and even health upgrades works radically different than in regular EDF games. Enemies no longer drop random weapon and armor pick-ups. Instead, they drop colored crystals, one of Iron Rain’s two forms of currency. Green crystals restore health but don’t act as currency. Completing missions gets you credits, with the amount of credits awarded tied to the mission, difficulty, and the rating you receive for the mission. Weapon and item drops are also tied to mission and difficulty. Players always get the same basic items from completing a mission, but the quantity of rewards increases by difficulty. Thus, beating the same mission on Hardest will unlock all of the rewards for that same mission on lower difficulties. But this doesn’t unlock them for use, just for purchase. You’ll still need to buy the weapon or item with credits and crystals. Players no longer need to beat missions on each difficulty level to get all the weapons, but they will need to farm missions for the credits and crystals to actually access all that gear. Equippable items are another of Iron Rain’s new elements. 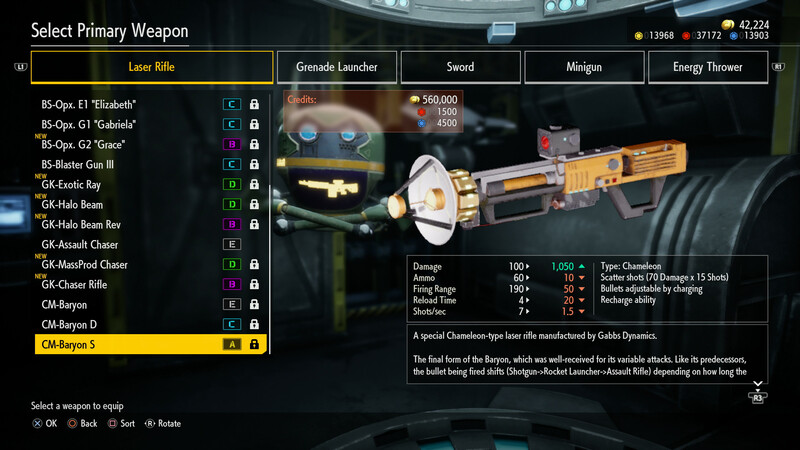 Players can bring a huge variety of items along during missions, including grenades, traps (turrets, landmines, etc. ), healing items, vehicles, and more. That explains why Iron Rain has no support class – any class can perform those functions here. But each item has a cost towards your selected PA-Gear’s item limit, so you can’t just bring a limitless supply of consumables. Items also have a credits cost. During missions, whichever items you use will reduce the amount of credits awarded for completing the mission. This applies not only to offensive gear; healing yourself or reviving other players costs credits too. It’s even possible to receive a negative reward for completing a mission if you use too many expensive items. But later missions pay out so many credits that the sting of using items all but goes away, especially on higher difficulties. Iron Rain’s campaign consists of 52 missions which can initially be played on four selectable difficulty levels. Beating the final mission unlocks a fifth difficulty, Disaster. Mission length is generally in-line with regular EDF games, as opposed to the Insect Armageddon missions that seemingly went on forever. While the standard five difficulties are all accounted for, gamers aren’t really encouraged to play through lower difficulties here. Beating missions on higher difficulties unlocks both the higher- and lower-difficulty items and more credits. Thus, it’s most productive to play on the highest difficulty on which your team can survive. Survival can be more of an issue than in previous games – Iron Rain is possibly the toughest EDF yet. Players and their weapons tend to be on the slow side, with limited dodging ability (everything costs energy) and most weapons coming with excessive reloading times. A few weapons have a quick reload function should players time their button presses right, but most don’t, annoyingly. Enemies aim and fire faster than in other EDFs, making dodging difficult or impossible in many situations. This leads to frequent difficulty spikes even on lower difficulty levels. Bringing along a vehicle helps a lot – they can take and deal loads of damage. Dying in single-player means automatically failing the mission. Only in co-op do players get to respawn. However, respawns are not unlimited in this EDF. The team gets four shared respawns, regardless of player count. Running out of lives makes the team fail the mission. Mercifully, players can bring along an item called a rebooter to revive a teammate without the team losing a life. Rebooters count towards a PA-Gear’s item limit, so most players won’t be able to equip more than a couple. 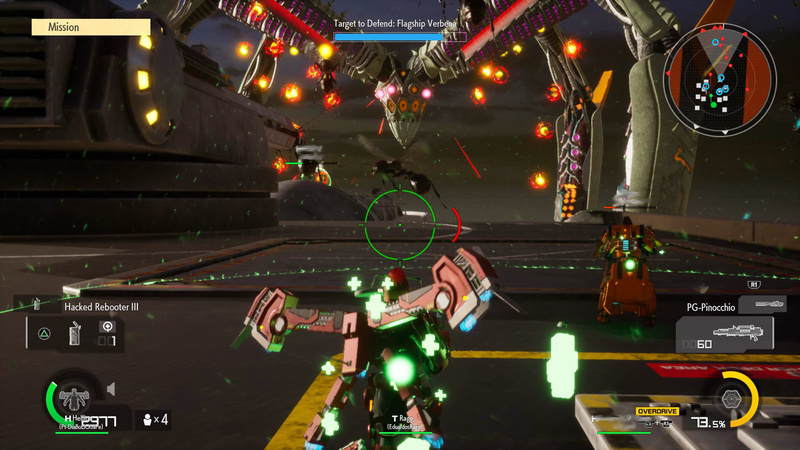 The limited respawns and need for rebooters creates some truly tense cooperative situations – the team needs to carefully manage its lives in order to overcome tougher missions. But the obvious flaws in this system are that selfish or ignorant players may not bring any rebooters, thus making them unable to revive anyone; and less skilled players will often consume all the respawns, causing the team to fail the mission. For the system to work more fairly for all, the number of respawns would need to scale with player count and/or hosts would need the ability to require rebooters to be equipped before starting a mission. Despite the challenging respawn system, Iron Rain can be a blast in online co-op. 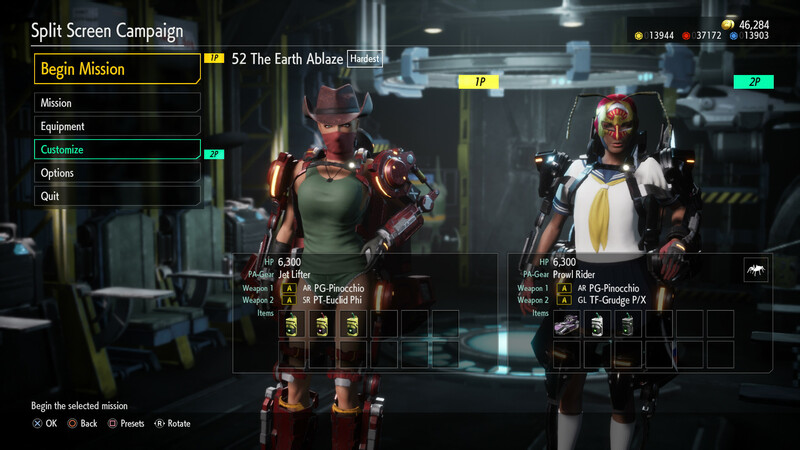 As usual, this EDF features a lobby browser instead of matchmaking. But this time, players from all regions can play together online, making it easier than ever to find teammates. The main online menu even displays the total number of people playing online, just in case someone wants to gauge the multiplayer population. Hosting games does have one little issue – the host can’t change the difficulty after creating a lobby. It takes making a whole new lobby to adjust the difficulty, which goes against the series’ traditional spirit of replayability. Hopefully the developers will fix this with an update. Still, Iron Rain has one option that no other EDF has had before: 6-player co-op! The increased team size makes firefights more chaotic than ever. Teams can split up into groups or simply surround tougher foes and blast them into dust. Friendly fire becomes an issue in the occasional cave level – you really have to where you shoot with so many comrades around. But the vast majority of missions provide enough room for 6-player cooperation to truly shine. There’s also an 8-player online competitive mode. Huge player counts aside, Iron Rain doesn’t have the same level of polish as last year’s sublime EDF 5. Some of 5’s innovations, like Wing Divers actually being able to fly for more than a couple of seconds, and players being able to right overturned vehicles, are disappointingly MIA. Multi-person vehicles are also missed, and the game crashes too often at present. That said, two patches have already arrived since launch, so Yuke’s and D3 seem intent on improving the experience in an expedient fashion. 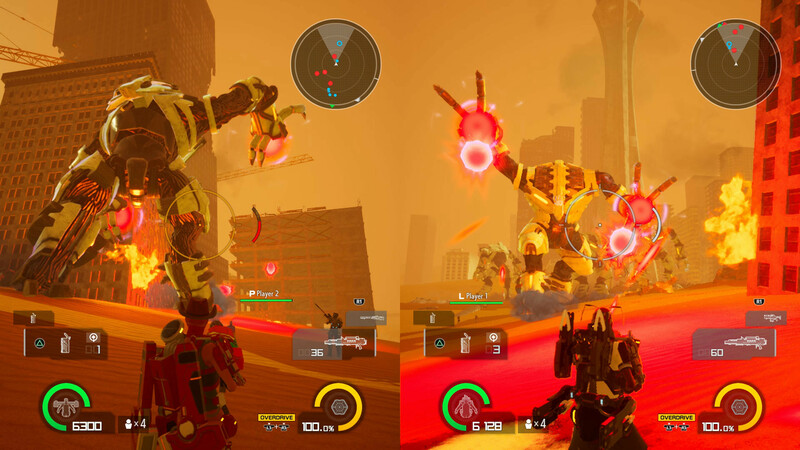 While Earth Defense Force: Iron Rain isn’t quite as huge or tightly-made a game as mainline EDFs, it still stands out as an EDF that truly looks and feels different than the rest. Gorgeous graphics, unique enemy types, the Prowl Rider class, and 6-player online co-op – these innovations would be more than welcome in EDF 6 or even Iron Rain 2. Iron Rain is a great introduction to the series for new players, and EDF veterans will be relieved at how much better it is than Insect Armageddon! The Co-Op Experience: Team up in 2-player split-screen or 6-player online co-op through 52 missions with five different difficulties. Teams share a fixed set of lives, but players can equip reviving items to conserve respawns. An active PS+ subscription is required to play the game online. Page created in 1.3423 seconds.